Are you looking forward to the new season of Broadchurch this March? Yes. I've been watching it on iView and I'm pretty intrigued about some of the new clues that have turned up. Not sure if this question is from an Australian, but we currently have a new series in Australia for 2 weeks now, and it is great. I love this show along with some of the other UK shows which are not on in Australia any more. I am,but David Tennant is one dimensional, full of angst, altho not an obsessive Dr. Who watcher I thought the series with him and Billie Piper was so great - good chemistry there, I do love the house he has, the colour, near the water. But... I think there will be more twists to the series, so must keep watching. I've watched the series Fortitude which follows Broadchurch here in Oz. The visuals are incredible... another one with twists and turns. Its rather creepy, cant call it partly sci fi, cos i'm sure there are many such research centres and that all places like this 'attract' people for different reasons. 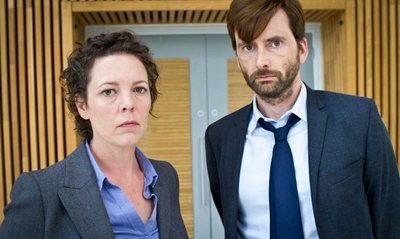 We haven't watched Broadchurch and although it may be good I'm just a bit over police shows. I'd much prefer it if I could understand DT's really strong accent. Couple of other Edinburgh actors are difficult to understand as well. That makes for exhausting viewing. Watched the first series on rented DVD, & ff'd through the lot! Will try & be more patient this time around, but may end up doing the same thing! Yes, I certainly will. There is 1 now on iview, & I thought that was the old series, so I'll start watching it now, if the 1st 1 hasn't left iview yet! It's a wonderful show. Would you prefer communicating with your customers via a screen or face to face? Whats the longest you've had to wait in the line and where?